Source: CICH graphic created using data adapted from Statistics Canada. 2006 Aboriginal Children`s Survey. http://www.statcan.gc.ca/pub/89-634-x/89-634-x2008005-eng.htm -accessed July 17, 2017. In 2006, primary caregivers reported that over 80% of Inuit children, Métis children and First Nations children living off reserve age 2 to 5 practiced their numeracy skills once a day through counting. A majority also read or looked at books daily and heard stories. 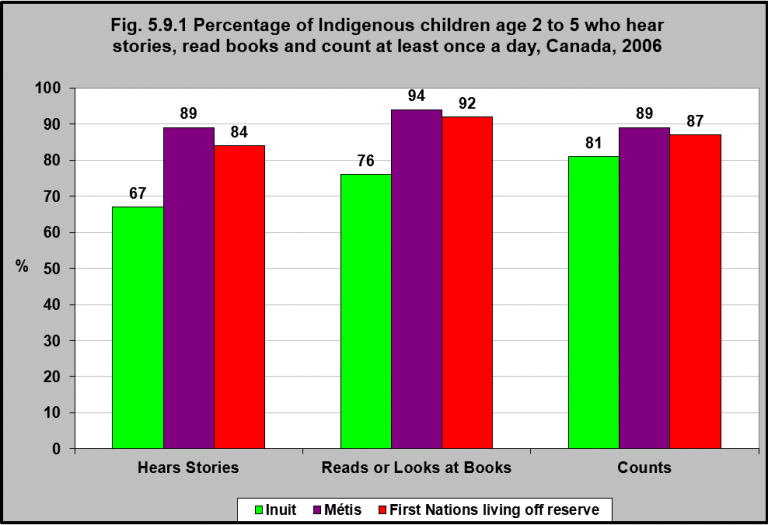 Inuit children age 2 to 5 read or looked at books and heard stories less often than Métis children and First Nations children living off reserve the same age. 1Encyclopedia on Early Childhood Development. (2011). Importance of early childhood development. http://www.child-encyclopedia.com/importance-early-childhood-development -accessed October 11, 2017. 2Government of Canada. (2011). What do we know about the well-being of young Aboriginal children in Canada. In The well-being of Canada’s young children (pp. 71-76). Ottawa, ON: Human Resources and Skills Development Canada, the Public Health Agency of Canada, and Indian and Northern Affairs.